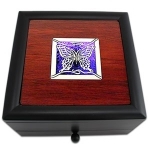 Find personalized jewelry boxes for women custom crafted with Kyle's gorgeous thematic designs and truly give the perfect gift for organizing earrings, rings, and watches. 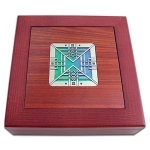 Choose from a wide selection of elegant wooden jewelry boxes for her as well as handsome mens jewelry box styles, each inlaid with creative designs and rich iridescent glass. 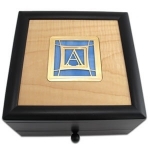 Optionally have your box engraved to make your gift as memorable as it is beautiful. 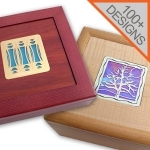 Black Jewelry Box - 100s of Customized Designs, Wood & Glass Inlay, 7"
Browse a selection of fine jewelry chests and engraved memory boxes for men and women who appreciate good design and fine craftsmanship. Each chest is inlaid with one of over 500 custom jewelry box designs, colorful iridescent or glass accents, and exotic woods. 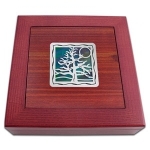 Kyle's decorative wood boxes are very special, each being beautifully made inside and out, and promptly shipped to arrive for your special occasion. 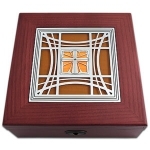 Each personalized jewelry box is individually handcrafted with stunning metal inlays and glass made in the USA by Kyle McKeown Mansfield - a California-based artist with exquisite technique. 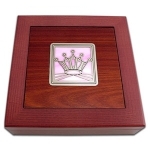 Choose from large and small wooden jewelry boxes with Kyle's exclusive designs of sports, animals, careers, religious, food, hobby, monogram, drink, number, music and nature to create a gift like no other. 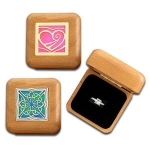 Depending upon the design and color selections you make, you'll have a beautiful jewelry box for a girl or a handsome memory box for a guy that you'll be proud to give. 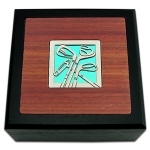 Kyle's engraved keepsakes will be treasured for years to come. You'll be mesmerized by the beauty of these quality, handcrafted jewelry boxes and valet chests which come in various eye-catching finishes. Kyle Design offers engraved black wooden boxes as well as exotic rosewood, bloodwood and maple. 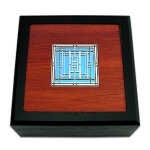 Etched metal themed designs sit against inlaid exquisite stained glass colors of rich blue, cool green, passionate purple, bright red, pastel pink, warm amber, or crisp white. 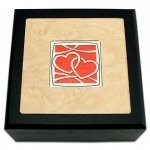 For more handcrafted gifts for the home, click unique home decor.